Marvin Briggs of Redding, California, shows off his best elk to date. 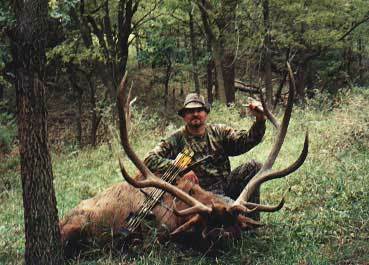 Briggs took the bull elk in September 1999 while hunting in South Dakota. The animal was a perfect 6x6 with heavy beams and green-scored at 360 B&C. Briggs took the bull at 26 yards with a 72-pound Hoyt (Raider) bow, Easton arrows, and Muzzy broadheads. Briggs stated, "This is currently my best elk to date in 27 years of hunting (including 8 years of bowhunting) and it now enjoys a place of honor on the wall of my living room."